ARRIVE 30 MINUTES BEFORE THE SCHEDULED START TIME. Our “All Levels” classes are beginner-friendly! New students receive one-on-one attention and guidance from senior students. Visitors: Visiting from out of town, or not registered yet? You’re welcome to watch a class, or join us on the mat to train ($20 drop-in fee to train; watching is free). Ages: The classes listed above are open to anyone age 13 and up. 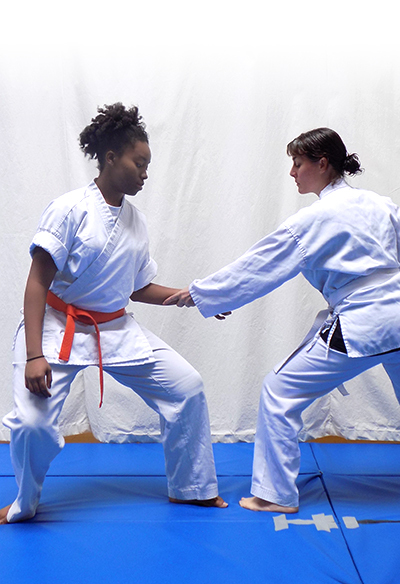 We also have an Family Aikido Program for children ages 7 and up (and their parents). Sword/Staff Class: Thursday night sword/staff classes are open to beginners. These classes are conducted in street clothes. We have spare (wooden) swords and staves. Be sure to check the Events page for the latest news on special events, off-site workshops, etc. And please feel free to contact us if you have any questions!